In the third quarter of 2017, prices for old single-family houses fell by an average of 1.7 per cent from the previous year in the whole country. 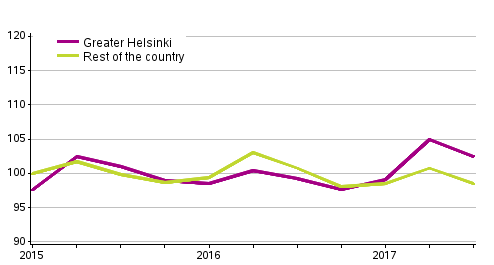 In Greater Helsinki, prices went up by 3.2 per cent while in the rest of the country they fell by 2.3 per cent compared with the corresponding period of the previous year. Compared with the previous quarter, prices of old single-family houses decreased by an average of 2.3 per cent in the whole country. 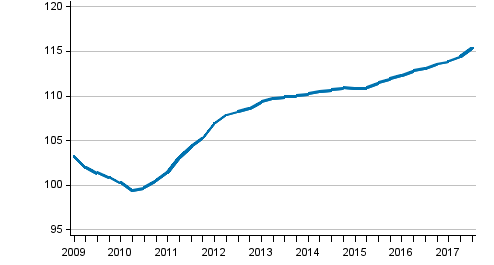 These data derive from Statistics Finland’s Index of real estate prices, which is compiled by utilising data from the real estate transaction register of the National Land Survey of Finland. In the whole country, the average price per square metre for old single-family houses was EUR 1,567 in the third quarter of 2017. In Greater Helsinki, the average price per square metre of single-family houses was EUR 3,121. In the rest of the country, the average price per square metre was EUR 1,478. In the third quarter of 2017, prices of single-family house plots fell by 1.0 per cent in the whole country from the year before. From the previous quarter, prices of plots went down by 0.5 per cent. The average price per square metre for a single-family house plot was EUR 20.0 in the whole country and the average plot size of sold plots was 2,665 square metres. In the third quarter of 2017, prices for new single-family houses rose by 2.0 per cent from the previous year in the whole country. Compared with the previous quarter, prices rose by 0.8 per cent. The data for new single-family houses are based on the building cost index and price data describing professional and own-account construction. ISSN=2342-8902. 3rd quarter 2017. Helsinki: Statistics Finland [referred: 21.4.2019].